Pain is a normal, healthy process that keeps our body safe. Localized pain is experienced when a part of your body encounters danger or harm. Like an alarm system, the nerves in that area start firing rapidly, alerting the brain to the problem. The brain is in charge of strategy and action -- turning on muscles that pull your hand off of a hot surface, helping you run from a goose that bites you, or convincing you to finally make that doctor or physical therapist appointment. So maybe you haven’t even been to see a physical therapist. Or your doctor, for that matter, because you think chronic pain is just part of having a body. Except it’s really, really not! Sometimes, that alarm that is your nervous system gets a little wild and takes a long time to settle down. When this happens, those nerves become extra sensitive and it doesn’t take as much to set them off. 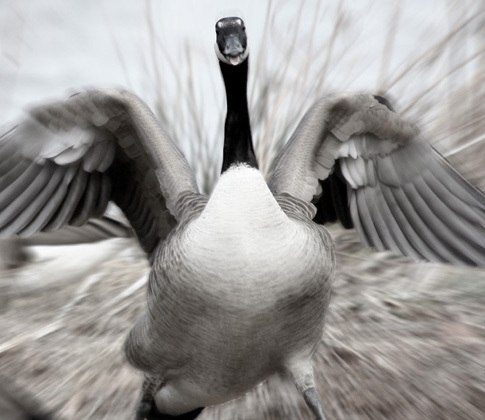 All of sudden, it really hurts to move in ways you are used to - like turning your head to check for traffic, standing up after sitting for a while, or sidestepping local geese hazards. Your brain interprets all the those alarms from your nerves and decides what to do next. Sometimes, the brain will ignore that alarm and you won’t experience pain right away. This occurs when your brain decides something else is more important. Like, if you fell and scraped your knee while running away from a really mean goose. You might not register the pain until you have reached a safe and goose-free zone. However, assuming there are no rogue geese in your general vicinity, you shouldn’t ignore your pain and you shouldn’t have to live with chronic pain. Back to the brain: your brain processes pain in a lot of different areas. Your brain interprets which part of your body is experiencing pain. Your brain also plans and executes movements to protect you from feeling pain. Memory centers of your brain remember former situations or actions that led to pain, while emotional centers dictate that you avoid those actions due to fear of pain. Just like encountering a goose, being in pain all the time is stressful and frustrating. Unfortunately, that stress doesn’t help the healing process it much. Actually, stress slows down the healing process! When you deal with the same old pain for a long time, it’s kind of like having a mean goose waddle around at your heels every day. On other words, terrible. So here’s the bottom line: Your daily life should not be ruled by aches, pains, or fears. Of geese or otherwise. Addressing your pain earlier rather than later is usually your best bet. My advice? See a physical therapist. Learn how to get stronger and move better. 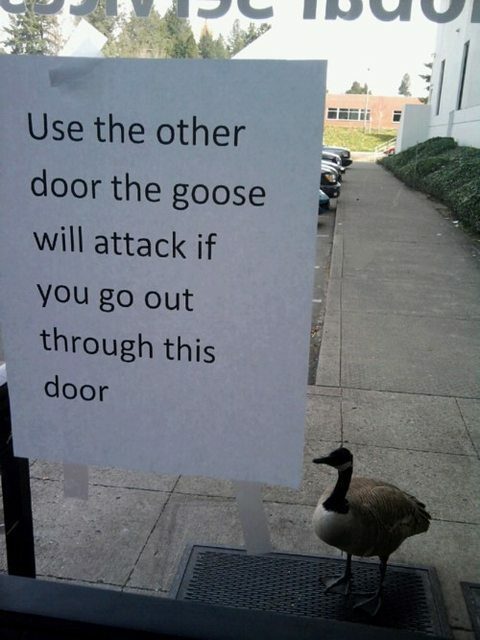 And always, always give geese a wide berth. Reference: Why Do I Hurt? : A Patient Book About The Neuroscience of Pain. Adriaan Louw, PT, PhD, MASc. 2013.